Ngöndro (Tib. སྔོན་འགྲོ་, Wyl. 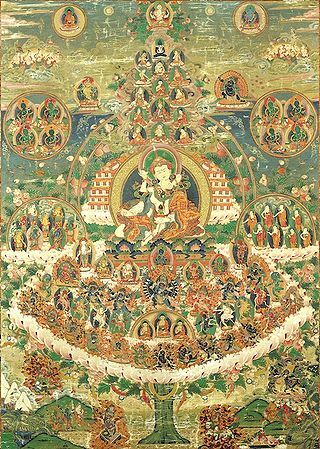 sngon ‘gro) — the preliminary or ‘foundation’ practices of Vajrayana Buddhism. The ngöndro practices are profound and powerful means for effecting a deep purification and transformation, at every level of our being. Not only do they prepare the practitioner for the profound path of Vajrayana and teachings of Dzogchen, but they also lead him or her gradually towards the experience of enlightenment. When we take our first steps on the Path, we are not yet capable of helping others. To accomplish the good of others, we must first perfect ourselves, by purifying and transforming our minds. This is the aim of what we call the preliminary practices, which establish the foundations of all spiritual progress. You may feel like dispensing with these foundations in order to practice teachings that you think are more profound, but if you do so, you are building a palace on the surface of a frozen lake. In Tibetan, ngön means ‘before’, whilst dro means ‘to go’. So ngöndro is usually translated as ‘preliminary practices’, or ‘foundation practices’. the repetitive cycle of frustration and suffering that is samsara. These contemplations are known as the "four thoughts". finally, in the practice of guru yoga, which is the most crucial, moving and powerful practice of all, we unite our mind with the wisdom mind of all the buddhas and so awaken the wisdom of realization. guru yoga removes the obscurations of all three: body, speech and mind. ↑ Dilgo Khyentse, The Excellent Path to Enlightenment, Snow Lion Publications, page 10. This page was last edited on 27 August 2017, at 10:08.